MOGA announced plans for the event to return to Mark Twain Lake in northeast Missouri in 2020. No date was set at the time, although it usually occurs around early spring. It has not been in the USA for five years. Now, as part of GeoWoodstock, the GPS Adventures Maze (GC827PV) will be in Ft Worth, TX, May 24-27. It is an educational and interactive exhibit to explain geocaching to new and experienced cachers. If you missed a GIFF event, you can go online to see the videos in the 2018 Geocaching International Film Festival. They are posted on YouTube. While everyone has a favorite, the Signal Award went to "TFTC" and the people's choice was about caching in Finland. 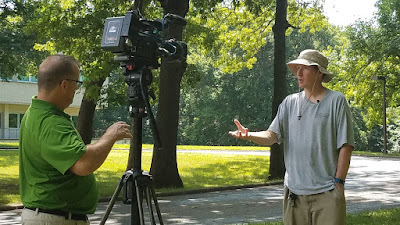 WAND TV in Decatur ran a video on geocaching using a CIGA caching family. It was filmed in Decatur using an actual geocache. 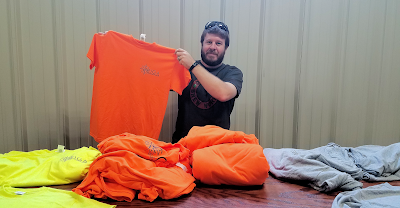 CIGA is offering new shirts for 2018. There is something different this time --- three choices for colors -- safety yellow/green, safety orange and heather gray. All are short sleeves at $15. Plus, something else is new, the heather gray has a long sleeve version at $19. The shirts are available at club events. See the merchandise page for more pictures. 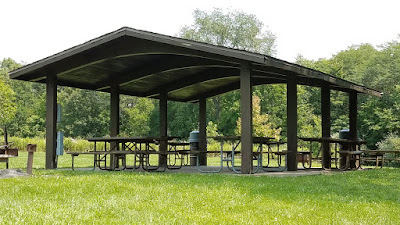 The group photo at the top of the page has been updated for the 2018 picnic. 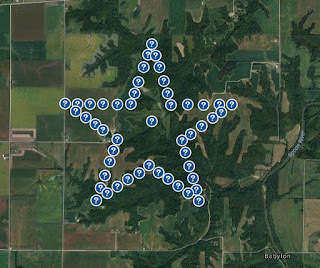 Central Illinois has a new geoart, Illinois Star. It is Illinois' contribution to a project to put a star in each of the 50 states. There are 50 caches northwest of Canton, in a project carried out by the CIGA and PAC geocaching clubs. They have state facts that help celebrate the state's bicentennial in 2018. Star 01 is GC7MKPP. 64C) with only three finds. Besides Illinois, attendees came from Iowa, Nebraska, South Dakota, Wisconsin, and the farthest traveled, Sweden. There were no lucky finders. But there were FTFs elsewhere at the park, as more than 170 new caches were placed for the event. Central Illinois is unique in geocaching. 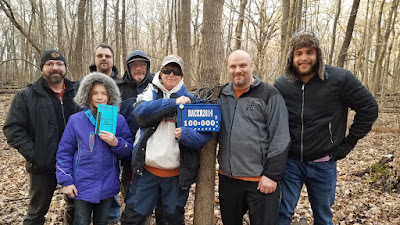 Two area cachers have reached 100,000 finds and were among the first ten to do so. Cachers at this level come from various states and countries. Only the specific central Illinois region has produced more than one. 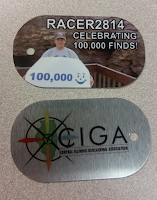 CIGA sponsored a recognition event in Decatur for Racer2814 presenting custom art by Sixrows and giving everyone a commemorative souvenir tag. 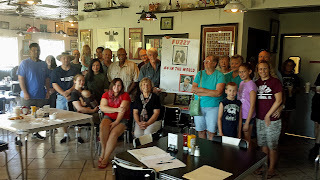 Earlier, CIGA organized a recognition event for Fuzzy B in Peoria. Those attending received a commemorative souvenir button courtesy of BoilMaw. 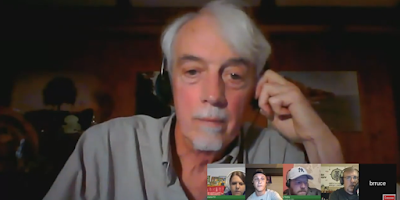 The Geocache Talk podcast featured Muther's Challenge shelter cache in its weekly program. It included discussions with Fuzzy, the cache owner. In case you missed it, the program is on YouTube at this link. It is one of the most watched geocaches in the world, 1040 watching. It has its own Facebook page. Commonly known as the shelter cache, the official name is A Real Challenge (Muther's Challenge), GC1764C. Back in 2007, Fuzzy B hid a cache at a picnic shelter at Jubilee College State Park, near Brimfield. Since then, only three people have found it. There have been more than 400 logged DNFs. "Muther" in the title is a challenge to caching friend MutherAndSun. A ten year event will be November 4 at a different shelter nearby. 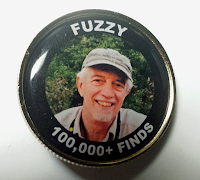 To help celebrate, Fuzzy will place 75 new caches at the park. 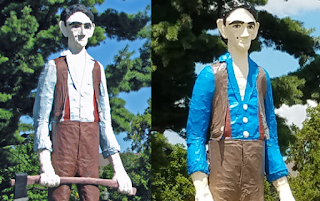 Railsplitter Lincoln is a 30 foot figure that stands at the main entrance to the Illinois State Fairgrounds in Springfield. After his right arm broke loose, he underwent repairs and repainting. Here is the before and after. Yes, there is a geocache there. tribute cache for racer2814 achieving 100K finds. Matt Holley placed GC70KA1 in Romeoville. For the latest news, visit the CIGA Facebook page and request access to join. The page has 500 followers from Illinois, Iowa and Missouri. CIGA has been geocaching in Central Illlinois since 2004. 2017 Group Photo The group photo on the home page has been updated from the 2017 picnic.